Home > Articles > How to eat balut? Balust is certainly not a food for everyone. Not everyone has tasted it in the Philippines either. But it seems to be a food for real connoisseurs. 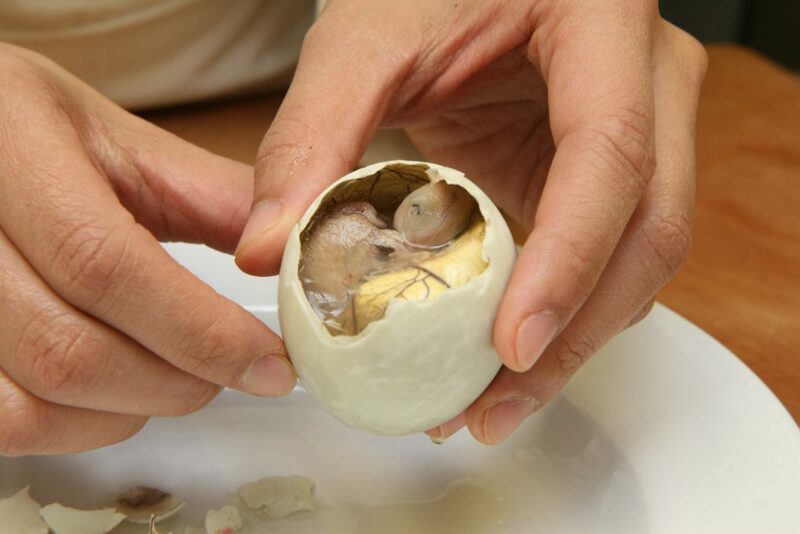 Balut is a typical dish of many Southeast Asian countries and consists of a duck or hen’s egg, fertilized and boiled in its shell just before hatching. Apart from the taste, the egg is boiled when the embryo inside is almost completely formed. Throughout Southeast Asia and in particular in the Philippines, it is considered an aphrodisiac food and for this reason, it is often sold by street vendors in nightclubs. “Balut” is translated into the Philippines as “wrapped”. It can be consumed directly from the shell, possibly seasoned with salt or vinegar. Alternatively, it can be served as a main dish accompanied by various sauces. The preparation begins with the collection of inseminated eggs, which are placed in baskets exposed to the sun and kept warm, to encourage the development of the embryo. After seven days, the eggs are examined against the light to check the presence of the embryo inside; those that contain it continue to be incubated for another eight days or so, after which they are ready to be boiled. In the Philippines the egg is boiled before it has reached 17 days; in this way, the embryo remains tender and entirely edible. Vietnamese and Cambodians are instead used to cook eggs after they have spent 20 or more days of development. From “poor food”, in the Philippines, this dish was also transferred to haute cuisine, served more frequently in luxury restaurants. At the town’s kiosks, baluts are sold for around 50 cents apiece. To consume it, make a small hole on the end of the shell, on the empty top of the egg. The broth is drunk inside, the opening is widened and seasoned with coarse salt. Spicy vinegar with chili and onion can also be used. Keep it warm, in the sun or in an incubator until you see the little chick growing inside the egg. To understand if the chick grows it is sufficient to look at the egg against the light. Choose at which point of the development you prefer to eat the chick. In some areas of Southeast Asia, they prefer to eat it when the embryo is still in its early stages. In other areas they wait for the beak and the bones to develop (after 20 days of incubation), to feel them creak between their teeth. 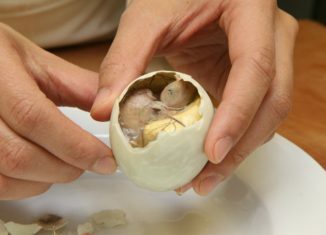 When you have chosen the stage of development of your balut, take the egg closed, with the live chick inside, and put it to cook in boiling water. The meat of the little chick will be boiled alive. What spices you use from where?